As we all enjoy the peak of the summer harvest, it’s a great time to highlight the unique, diverse, and fragile ecosystem we all depend on to nourish ourselves. Eat New Zealand is a food movement driven by a passionate collective of New Zealand’s chefs, producers, media, tourism and event operators, who have all been inspired to create a national platform to promote and champion our best food, drink, and culinary tourism opportunities. Through a focus on supporting and encouraging sustainable food systems they are showing the world how we can work together to protect our natural environment and the food resources that come from it. 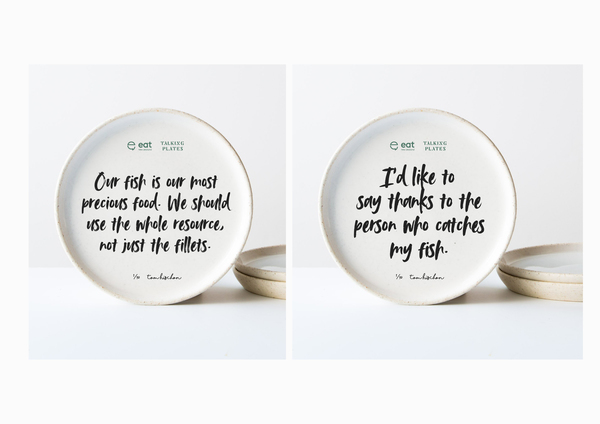 It is from this focus on sustainability that Eat New Zealand has created ‘Talking Plates’. Talking Plates is a pop-up kitchen that will travel around to events and festivals from one end of the country to the other dishing up discussion (and delicious food) to the public. We chatted to Angela, Chief Executive of Eat New Zealand, to find out more in the lead up to Talking Plates launching on 16 February at the Nostalgia Festival in Christchurch. We’re a New Zealand food movement & the New Zealand Food Story is ‘coming of age’. No longer are we just a supplier to ‘the mother country,’ but rather have so much to be proud of in terms of our own ingredients and people and food culture. This campaign is about raising funds and awareness to tell the story of our people and our food. It’s called ‘Talking Plates’. We’re going to be dishing up discussion alongside our food with ‘Know Your Farmer’ and ‘Know Your Fisher’ stories (we’ll even have a Fisher at our launch event at Nostalgia in a couple of weeks time), ‘Eat NZ Grains’ and ‘Build Food Communities’ (as part of a food resilience & food sovereignty) are other aspects we’d like to draw awareness to. Eat New Zealand exists in its current form because a successful PledgeMe campaign a couple of years ago. We were then called ConversatioNZ, and thanks to the support of everyone we got the show on the road. SO much has happened in the last 2 years, but it seemed a really nice thing to come back to our original crowd to kick things on further. Some amazing meals at some of NZ’s best restaurants, from Auckland to Dunedin. Workshops for everything from becoming a Instagram star to growing your own food. And we’re just about to release the very first Eat New Zealand t-shirts! Please help us out! Our vision is for New Zealand to become the world’s best food destination and we know we can only achieve that by creating & supporting sustainable food systems. If we all work together there is much goodness & deliciousness ahead! Check out the list of truly epic rewards and pledge your support for sustainably excellent food here.